BASKETBALL: The South West Metro Pirates came to town, but it was captain Charmian Mellars and her crew who flew the flag to win 86-67 at Kev Broome Stadium. The powerful win consolidates the Port City team in the top four. Tabatha Richardson-Smith showed why she is one of the top three players in the QBL with a stellar 34 points and three triples while point guard Kayla Kiriau was the perfect ally with 18 points. Mellars was tough and aggressive and shot 17 points and post players Cassie Rochel (10 points) and Alicia Carline continues to get better and better. The hosts started slow with missed opportunities under the rim allowing the Pirates to have a 21-14 lead at quarter-time. 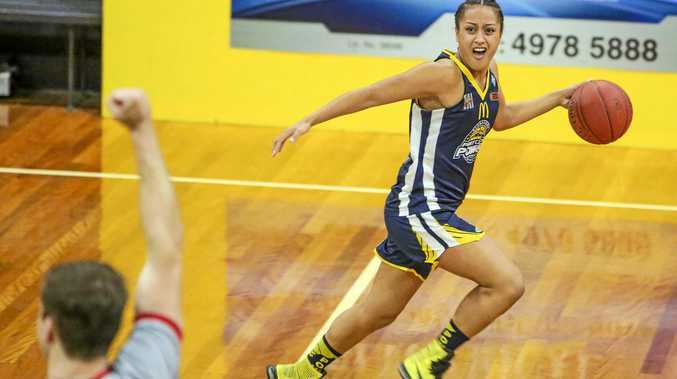 "I think that during the whole week coach Ray (Cooper really emphasised three-point shooting, so we just really practised on covering the shooters and we just worked off the screens and emphasised with our talking defensively," Kiriau said. "So our think our talking really helped." Gladstone Port City Power got the first two baskets of the second quarter to make it 21-18 before Pirates extended their lead to seven points after ex-Power player Maddy Willey produced a classy drive. Carline made it effectively a four-point play - first with a great assist to Mellars and secondly Carline produced a defensive block. Scores were locked away at 35-35 at half-time. The Power skipped to a 44-39 lead despite some strange calls from the umpires, but when Richardson-Smith produced a basket when she was off balance - the crowd were on their feet and the home side were hard to stop with a 12-point advantage. It was a procession in the final 10 minutes and the stadium rocked after Mellars produced a solo effort when she intercepted a loose pass and drove for a successful pull-up jumper. Best for the Pirates were Shelby Cheslek who worked hard for 23 points along with Stephanie Bairstow and Willey (two triples) who both shot 16 points. "I think that third quarter and when we caught back up at the end of the second," Kiriau said about when she thought the Power gained the momentum. "Coming up in the third, we usually have slow starts with every other games, but this game we just tried to keep the momentum going. Kiriau added that the team has extra depth with contributors now coming off the bench. She explained the team has the right mix of players who add an inside and outside game which keeps the opposition guessing. The Power have a huge test where they head north to face third-placed Mackay Meteorettes this Saturday from 6pm.